Me, age 15 in the high school library looking over microfiche and taking notes on note cards as had been suggested by our US History teacher. As prickly as he was hilarious, he had a ruler he thwatted against the table and black board for emphasis. He made Republican jokes and I was very proud of the notes I took in his class. I used a variety of colors, more for aesthetic presence than any sort of code. He said once the only reason he became a teacher was because he always liked his teachers andÂ wanted to be similarly liked. He said once he’d started teaching he realized it was only the good students that liked you and there weren’t very many of them. I wanted to be a good student. Actually, I was passable. To be fair, I only chose to write about the Haymarket Riot because “riot” was in the topic title. And, actually, I do not remember much about my research. I remember being interested in how people managed to organize under such exhausted, alienating conditions. I remember being surprised at the conditions under which they worked; for instance, that previous to the riot people worked more than 8hrs a day on the regular. But aside from that I only recall my preoccupation with not plagiarizing and using a variety of pens to make my note cards handsome. The rest of that paper is a blur. The older I get the more I discover blind spots like theseâ€”details that slipped past the guards of my younger memory. 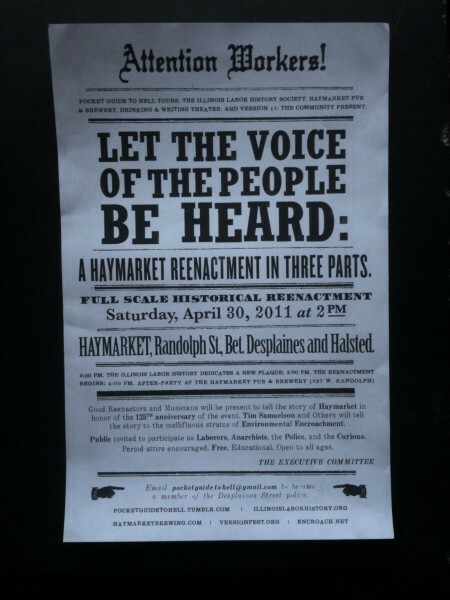 Today, May 4th 2011, marks the proper 125th anniversary of the Haymarket Riot. 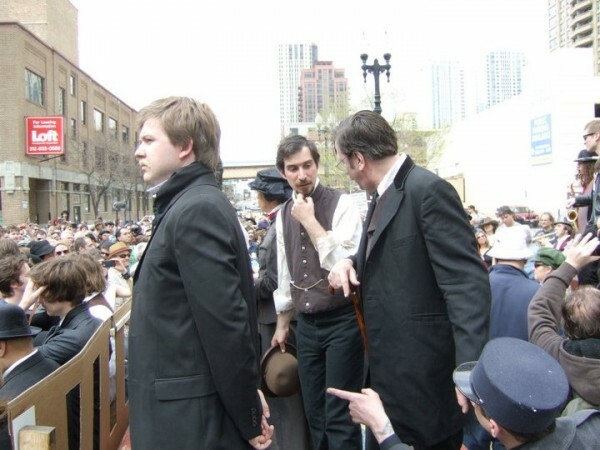 On Saturday, April 30th Paul Durica’s well-loved A Pocket Guide To Hell partnered with the Illinois Labor History Society, Version 11: Community, the Haymarket Pub & Brewery, Drinking & Writing Theater, and the Fulton District Association to stage a reenactment of those 1886 events. There were two groups. 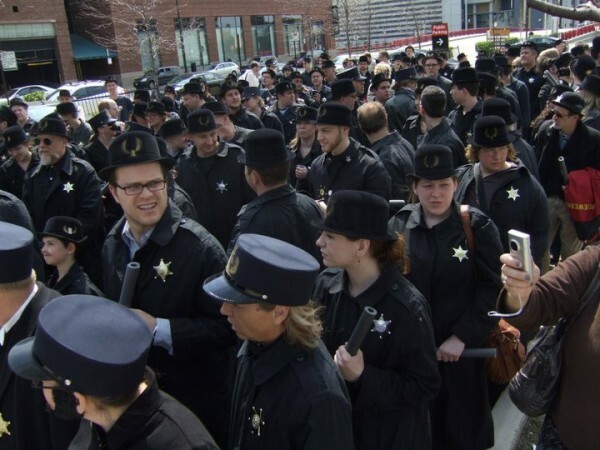 One, the one I was a part of, met at the Haymarket Brewery to get dressed up participate as police. 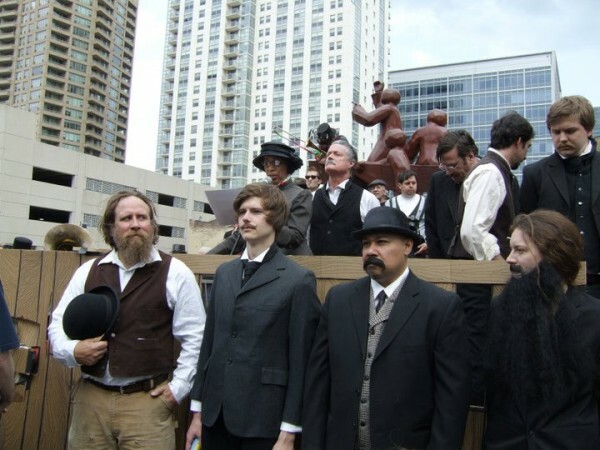 The other, the anarchists and attendees, gathered at Randolph and Desplaines where a history was read and performed from a predetermined script. I can’t speak for what happened in the square before our arrival, so I’ll just give you a play-by-play of my experience. We had a Green Lantern squad. A merry band of buddies met me at the bar where we were given black coats, hats, and asked if we’d prefer to be wounded or have cap guns. I chose to be wounded and a small gold sticker was put on my shoulder. I was given a captain’s hat, as someone who had organized other volunteers. I admired a woman’s moustache, went to the bathroom and had second thoughts about whether or not I’d rather shoot a cap gun. Maybe I didn’t want to get wounded after all. I hadn’t pretended to do anything (publicly) in so long, the adolescent part of my brain bit my adult lip with consternation. I decided to stay the course. I decided I’d enact a stomach wound. I practiced, quietly, grasping my abdomen, imagining how I would fall down. I very much liked my captain’s hat. Coming back to the main room I couldn’t recognize my party because everyone wore the same black coats. The room was filling up rapidly. A waiter came around with a tray full of very small beers. I had one and found my people. Environmental Encroachment started to play by the doorâ€”a punk marching band cut from the same cloth as Mucca Pazza. Hearing them made me happy because EE had played in the first Green Lantern about five years ago during some crazy circus house-cat performance (don’t ask). While I’ve never been one to fully embrace the mystical significance ofÂ synchronicity, I have always taken some comfort in our ability to return to themes. Similarly, I started thinking about that first paper I wrote. I started thinking about how much my understanding of historical sequence has improved. I did not have enough context when I wrote that paper as Sophomore year. Of course, you have to start somewhere but as a 15 year-old the 1700s seemed as far away as theÂ 1800s. It was like I experienced a temporal parallax from my 1996 co-ordinate. I had no means with which to conceptually measure those temporal distances. Now, 15 years later, I have a deeper sense of consequence and a better understanding of how one thing leads to another. 20 years is a literal distance that I’ve already traveled. Or, for another example, I understand how modernism lead to post-modernism. Nevertheless, the understanding of my 30 old-self is still based on an intellectual apprehension. History is still not present to me. 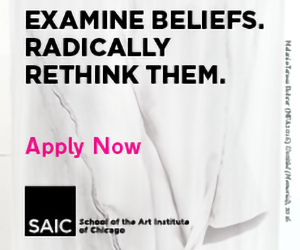 Even thinking through all of the recent revolutions and protests, from Cairo to Madison: there is a way where people are active in the present for deep ideals which may be incongruous with theÂ hierarchical structures in which they are embedded. I’m thinking also of England, where students have been protesting almost constantly about the need for free education. By participating in this reenactment on Randolph and Desplains, I had an opportunity to internalize my own history so that my understanding wasn’t simply intellectual, but became a muscle memory. Someone stood up on a stool and gave us instructions. We were to march in a group around the block to a parking lot across the bridge. In the parking lot more attempts were made to organize the police. We were instructed to form lines, 24 across and 8 deep. We were at least 2 more sets of 8 going back. And it was a great crowd. 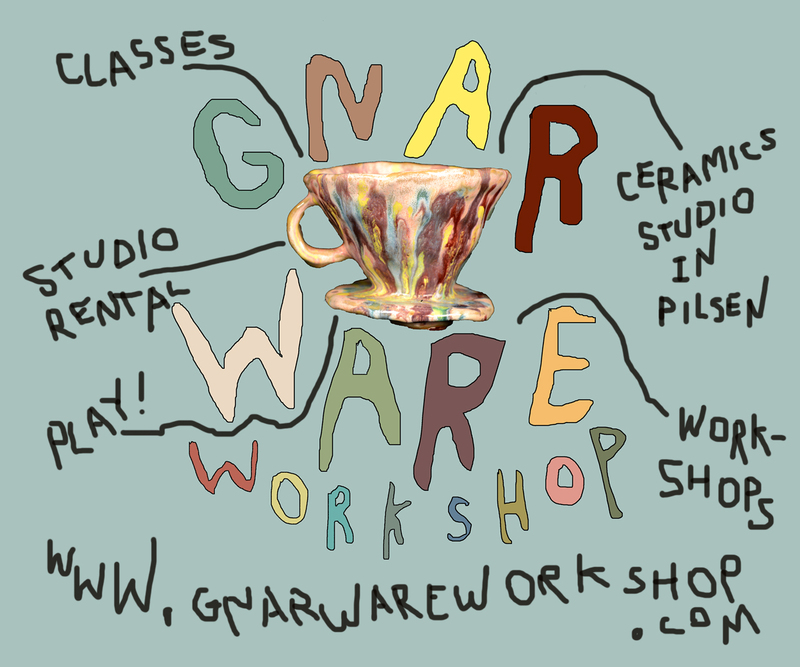 One of the thingsÂ I love about Chicago is the way a multifarious group of people working under the larger umbrella of cultural action (here I’d include DIY movie theaters, artspaces, publications, activist groups) can come together to participate in another group action. Certainly we’ve been seeing a lot of that lately, for instance with the MDWY Fair. The Haymarket Reenactment was no exception. Organizations like Quimby’s, The Dil Pickle Club, The Nightingale, Columbia College, featherproof, Quickies, Dance Dance Dance Party, Stop Smiling, MAKE Magazine and others all had their own squad of 6+ people. Further, within the confines that Durica prescribed people were also able to enjoy themselves. There was a built-in chaos or disorder that had been accounted for. It was most apparent in the parking lot where we waited. The lines deteriorated slightly. It was hot. People made jokes about the sun finally coming out at last after so much winter. When at last, we began to walk down the street we started to march. It was an unplanned development but we stomped our feet in unison while simultanesouly thwacking our costume-issued gray, styrofoam pool-noodle clubs. I suspect a similar movement took hold of the original police;Â approaching a large mass of people will always be intimidating and if you’re assuming any kind of authority you need all the help you can get. Sharing a drum beat from your feet works pretty well. We could see a massive group of people standing in the middle of Des Plaines. There was a road block. Proper police stopped traffic to let us pass and someone opened the street barrier so that we, as a group (still in lines somehow), could walk into the middle of the throng. An anarchist in a vest spoke to us through the microphone by the Haymarket cart. The POLICE march up Desplaines to the Wagon, forcing spectators and workers north. WILLIAM WARD approaches FIELDEN. WARD: I command you, in the name of the State of Illinois, to immediately and peaceably disperse. WARD: I command you and you to assist. EdMar made his way to the front, and waved his gloved hand in a queen’s wave. Someone threw a dusty cloth up in to the air. It was white and it burst into a small smoke. There was the sound of a bomb. This was our signal. I began my death scene. A number of cap guns went off. Photographs scrambled to take pictures. I heard others groaning. THE HISTORIAN: No more than 5 minutes elapsed between the explosion and the last gunshot. No one knows who threw the bomb. No one knows how many workers and spectators who wounded or killed. The wounded along with the wounded police, 60 or so in number, were taken back to the Desplaines Station. One officer, Mathias Degan, died instantly from his injuries; seven others died later. The reenactment continued in a kind of fast forward over subsequent events. Most of the police who were wounded were wounded by friendly fire. Police started to sit up or stand up in order to listen and watch the performance. A mock execution was held. We listened to their last words. The actor who plays WILLIAM WARD is now SHERRIFF MATSON. He approaches the remaining 4 men who now stand with hands clasped behind their backs. After each speaks, he puts a hood over their heads. Parsons is cut-off mid-sentence. MATSON makes a gesture with his hand and the 4 drop their heads. SPIES: The day will come when our silence will be more powerful than the voices you strangle today. ENGEL: (in German) Hurray for anarchy. Hurray for anarchy. FISCHER: Hurray for anarchy. This is the happiest moment of my life. MATSON and the 4 men receded into the crowd. The WORKERS hold up a sign reading June 25, 1893. This is the way we fast forwarded through time: by signs held up with dates on them. In this way, a narrative was enacted, such that the consequences of the riot were brought to their conclusion. LUCY PARSONS (Alma Washington): My children and I were not allowed to see Albert the morning he was murdered. We were arrested outside the jailhouse. Thousands lined the streets as the bodies of the 5 men made the journey to Waldheim Cemetery. On June 25, 1893 a memorial was dedicated to them. The next day Gov. Altgeld pardoned Schwab, Fielden, and Neebe. The fight for the 8 hr. day continued. The fight for a just and better world continues. Paul Durica started making his own speech, stating in particular what became my sixth tweet. It might seem tiresome, in some way, to include those transcripts. I did so, however, to help frame the whole experience. To show how much thought and effort went into the architecture of the event. It had been in the works since November and a ton of people participated to make it happen. To me the experience created a different rubric for education. By participating in a reenactment like this, one is directly implicated in the action of history. Furthermore, at least for me, I felt pretty carefree throughout all of it. I don’t think I was taking it seriously, exactly, swept up as I was in the energy of a group. Yet suddenly, I found myself hearing the script, hearing that only one policeman died on the scene. Realizing that I probably would not have been that policeman (despite my dramatic pose). I bumped into historical accuracy in such a way that, I expect, I will always remember those dead and wounded. Furthermore, when I climbed back up from my pose on the street, I heard four speeches as bags were placed on four people’s heads. It was suddenly somber. The subsequent speakers had an earnestness about them which I’m not sure I would have appreciated had I not been so cavalier beforeâ€”because suddenly everything felt real and I was overwhelmed with a tactile experience of how our lives today have been so directly impacted by this short historical blip.